Preheat a gas or charcoal grill to high. 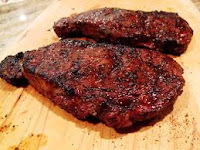 Rub each steak on both side with the dry rub, refrigerate at least 3 hours or overnight. Drizzle olive oil over both sides of steaks and grill until golden brown, 3 to 4 minutes. Turn over and continue grilling 4 to 5 minutes for medium rare. Place on a large serving platter and brush with Tex-Mex Barbecue Sauce before serving. Note: This rub can be used on beef, lamb, poultry and seafood. Combine all the ingredients in a small bowl. Store extra will keep in a tightly covered glass jar for several months. Wash, peel and dice potatoes equal in size. Place potatoes and bay leaf in medium saucepan; cover with cold water and bring to a boil. Reduce heat and simmer, covered, about 15 minutes or until potatoes are fork-tender. Drain well but reserve ½ cup of the cooking liquid and remove bay leaf. Place potatoes, salt, pepper and thyme in large bowl; beat with electric mixer just until mashed. Beat in vegan mayonnaise and if needed, the cooking liquid until almost smooth. Stir in parsley and scallions be careful not to over mix. You want your potatoes light and fluffy too much mixing will make them stiff. 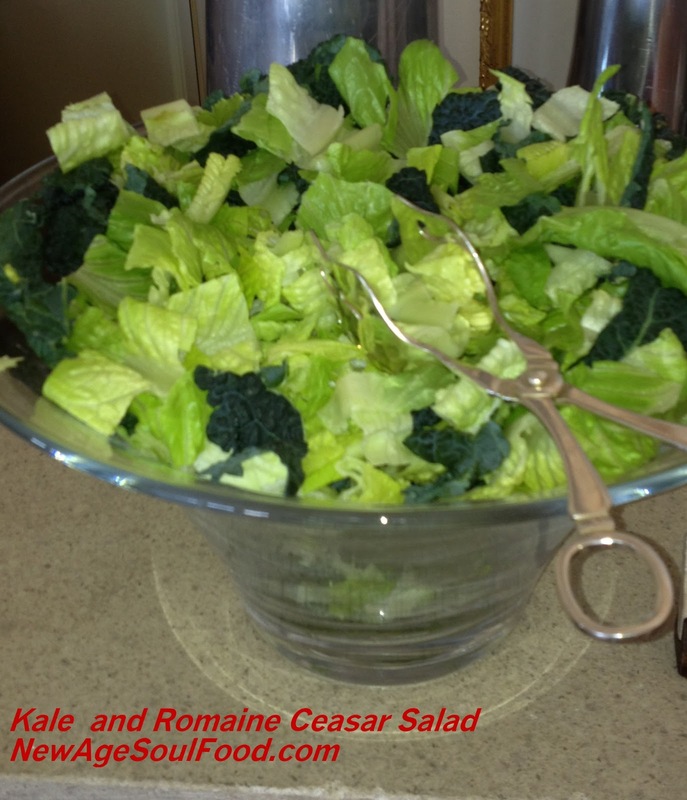 Cut broccoli into florettes, peel and dice the stalk into 1 inch pieces. 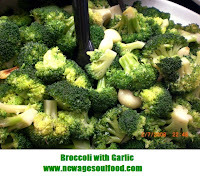 Place broccoli into a large pot of water and boil for three minutes. Remove from heat and drain in a colander. Discard the bay leaves. Meanwhile in a large sauce pan heat the oil add the chili peppers and saute until peppers are slightly browned. Add the garlic and saute until cloves are golden in color about 2 minutes. 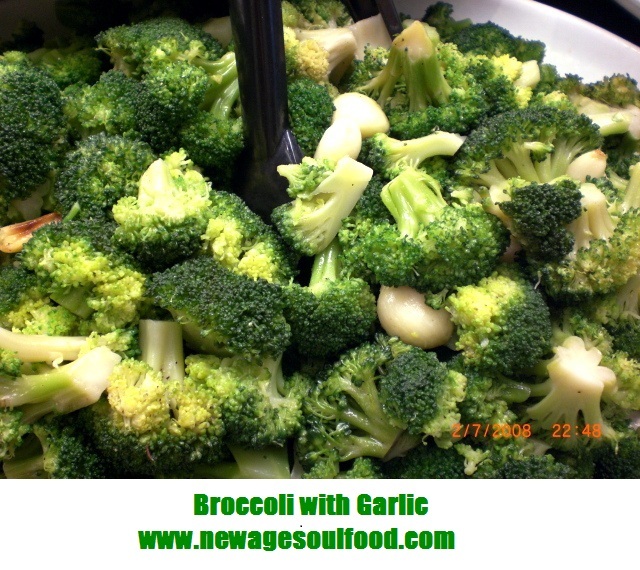 Add the drained broccoli, sea salt and mix until broccoli is coated with the oil, and seasoning and the garlic is distributed throughout. Preheat oven to 450 degrees Slice squash lengthwise and remove seeds Wash sweet potato and cut in half lengthwise Brush the inside of the potato & squash lightly with olive oil then sprinkle lightly with salt, pepper and garlic powder. Bake in oven 45 minutes or until tender. The potato will get done before the squash, so remove it when it’s done. Once they are cool enough to handle, remove skin from the potato and scoop the squash out of its skin with a tablespoon. Mash both the potato and squash with a potato masher. Add vegetable broth to a large stockpot and place over medium heat. Add mashed vegetables to the broth. Sprinkle in the remaining salt, coriander and pumpkin spice then mix thoroughly. Bring soup to a boil then reduce heat to medium low. Cook uncovered 30 - 45 minutes or until soup thickens, stirring occasionally. 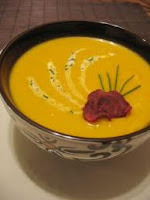 If you have an immersion blender (hand blender), puree the soup in the pot. 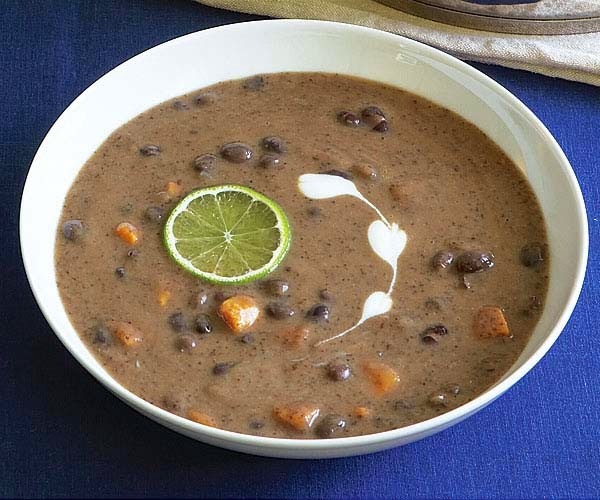 If you do not have an immersion blender, transfer soup in batches to a food processor or blender and puree; then return it to the pot. 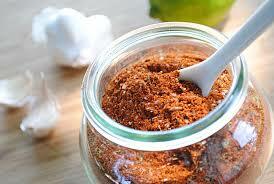 Check for seasoning and add pumpkin spice/salt – ½ teaspoon at a time if needed. Bring the soup back up to a boil then reduce heat to medium low. Continue cooking uncovered an additional 15 minutes or until it reaches the desired thickness. Keep in mind that once the soup sets, it will become twice as thick. Combine dressing ingredients in a jar or container with a lid and shake well. 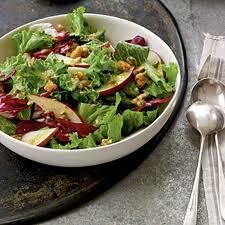 Combine mixed greens, pears and walnuts in a large bowl. Toss salad with ½ cup of dressing. Reserve remaining dressing for individual usage. 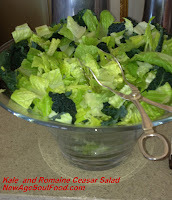 Store any remaining dressing in refrigerator for up to 3 weeks. Remove the pork from the pan. Cover and place in the oven cook for 2 – 3 hours or the meat thermometer temperature reaches 140 degrees F.
In a sauce pan, heat oil and chili peppers, add garlic and saute on medium heat 1 minute do not let garlic brown. Add spinach, sea salt and lemon juice, mix thoroughly and saute just until spinach is wilted and all ingredients are thoroughly mixed. Heat the oil over medium heat in a large pot. Add the onions and garlic and saute until onions brown slightly. Add coriander, cumin, and pepper and mix thoroughly. Add the broth, beans, sweet potatoes and salt, bring to a boil. Reduce the heat and simmer, uncovered, stirring occasionally, until the sweet potatoes are tender. Remove 2 cups of beans, drain and set aside. Puree the remaining soup in batches in a blender or using an immersion blender. Return the beans to the soup taste and adjust seasoning as needed. Serve with a slice of lime. Place all other ingredients in a blender or use a hand blender and puree until smooth and creamy. Store dressing in the refrigerator for up to 2 weeks. Method Note: You do not want to pierce the chicken with a fork or other sharp objects, this will cause valuable juices to escape. Position an oven rack in the upper third of the oven. Remove the giblets from the chicken, wash the chicken inside and out with cold water and remove all of the gook between the bones, etc. Let the chicken drain, cavity down, in a colander for 2 minutes. Pat the chicken dry with paper towels. Juice 2 lemons and whisk together with the wine, olive oil, salt, pepper and garlic. In a medium roasting pan, line the bottom with the fresh herbs then place the chicken breast-side down in the pan and pour the marinade all over the chicken, both inside and out. Prick the remaining 2 lemon with a fork in 3 – 4 places to release the juices and then place them inside the chicken. Cover, refrigerate and let chicken marinate 2 – 3 hours. Remove chicken from the refrigerator and let pan come to room temperature while you preheat the oven to 400°F. 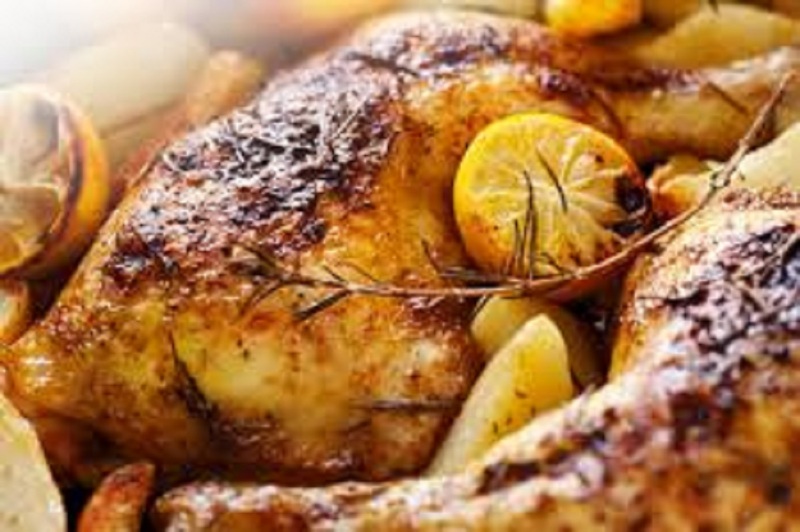 Place the chicken in the oven uncovered and lower the temperature to 350°F, and roast for 15 minutes. Remove the roasting pan from the oven. Using tongs or two wooden spoons turn the chicken breast-side up and return it to the oven and roast for 1½ hrs., [~ 15 minutes per pound] and chicken is golden brown. For safety purposes and the best results use a meat thermometer. After cooking chicken for the estimated period [~ 15 minutes per pound], insert thermometer in the thigh joint and if the internal temperature is 165 degrees, it’s done [leave thermometer in chicken until ready to carve]. Using tongs or two wooden spoons, transfer chicken to a platter and let it rest for 10 minutes before piercing with a fork or carving. Strain the juice from the roasting pan into a sauce pan, discard the herbs, bring to a boil, reduce heat to medium and simmer uncovered until juice is reduced by ⅓. Now here’s the secret: Pour the juice on top of the sliced chicken—this is the “marry me juice.” Garnish with fresh herbs and lemon slices. Over medium heat, in a large skillet add the oil. 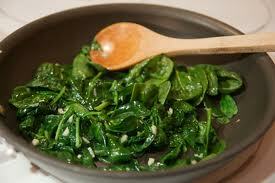 When oil is hot enough add the minced garlic, saute about 30 seconds. Add the cubed pineapple and mix thoroughly. Add the rice season with salt, black pepper and granulated garlic, mix thoroughly. Cook until rice is heated throughout, mix in the parsley and remove from heat. In a large stockpot, cover the beans with water, covering them by 2 inches. Add bay leaf, cumin, oregano, and chili pepper. 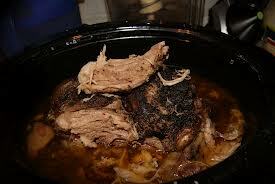 Simmer on low heat, with pot partially covered until the beans are tender, but not completely done, about 1 hour. While beans are cooking, roast the red and green pepper by placing them directly on the burner, turn with tongs until the whole pepper is charred. Place the peppers in a zip lock bag for about 15 minutes. Once the peppers are cooled, remove the stem and black skin to reveal the smooth layer underneath. Cut the peppers open to remove the seeds then dice. In a sauté pan, add the olive and sauté onions, peppers and garlic until onions are translucent. Transfer to a blender, add the vinegar and puree to a pulp. Use some of the bean water if needed to the puree. Add the puree to the beans, season with salt and continue to cook until beans are done about 30 minutes. In a large sauce pan or wok, add the olive oil, peppers, onions, garlic and1/2 teaspoon of salt. Saute until onion are translucent. Add cabbage, granulated garlic, remaining salt, pepper and liquid smoke, mix thoroughly, cover and cook on medium heat 20 minutes mix at least 3 times during the cooking period. At the end of 20 minutes mix in the parsley and remove from heat. 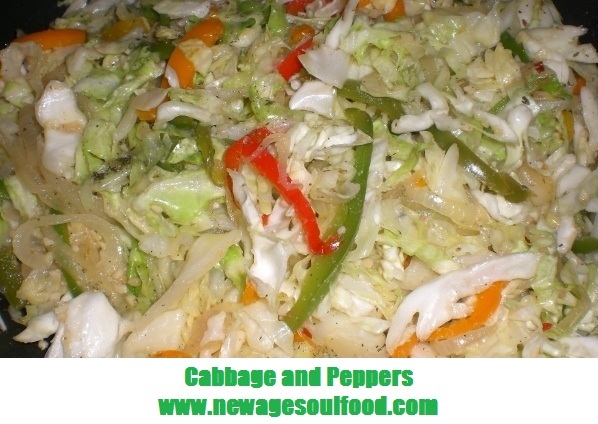 Cabbage should be firm at the end of the cooking period because it will continue cooking from the residual heat and you do not want it to become mushy. 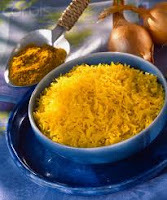 Stir together all ingredients and 1 cup water in a medium saucepan over medium heat, and bring to a boil. 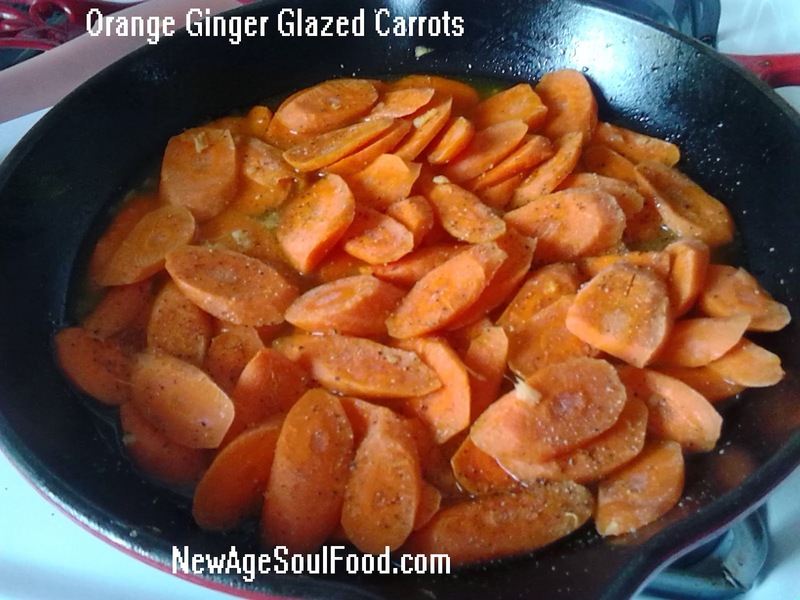 Reduce heat, and simmer, stirring occasionally, 30 to 35 minutes or until liquid evaporates and carrots are glazed. *1 teaspoon ground ginger may be substituted. Mom: Holidays are over, the new year is here now it's time to regroup and cleanse our bodies and mind. Angelique: We're going to start our year out with the Master Cleanser Diet. 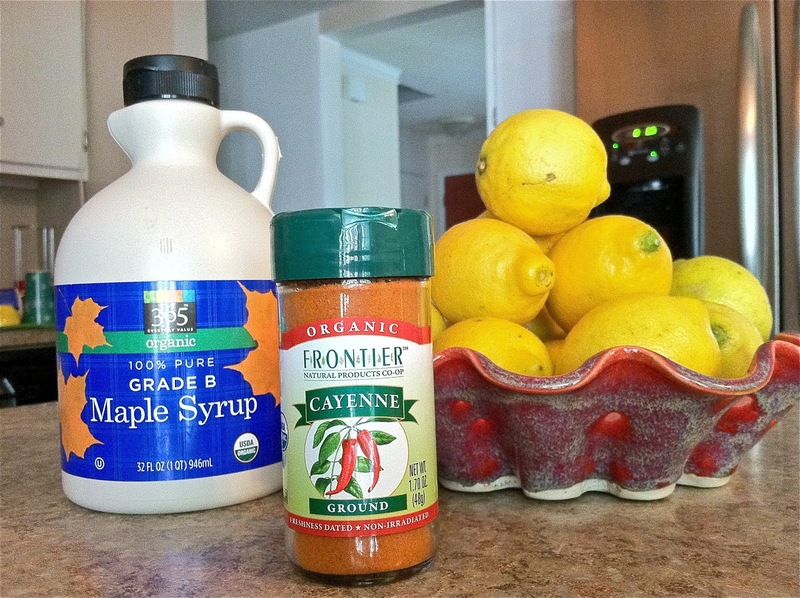 Many of you know it as the Lemonade Diet, you know the lemon juice, cayenne pepper and maple syrup diet. Mom: Here is a quick guide to the cleanser. Have a Happy, Prosperous and Health New Year! How to Make "The Lemonade"
Combine the juice, maple syrup, and cayenne pepper in a 10-ounce glass and fill with medium hot water. (Cold water may be used if preferred.) Use fresh lemons or limes only, never canned lemon or lime juice nor frozen lemonade or frozen juice. Use organic lemons or limes when possible. 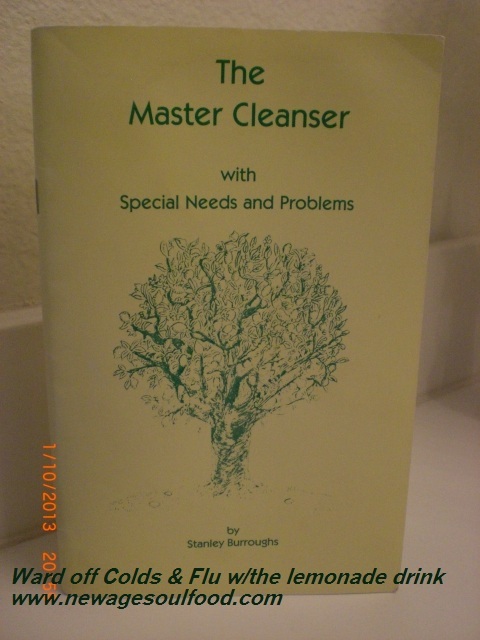 For complete information on The Master Cleanser by Stanley Burroughs you can purchase the booklet at most health food stores.